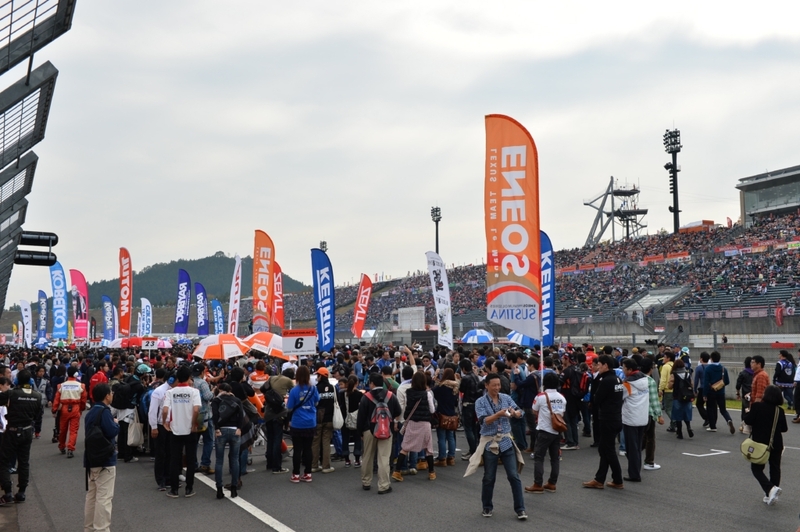 The MOTEGI GT 250km RACE, Round 8 (final round) of the 2013 AUTOBACS SUPER GT was held at the Twin Ring Motegi (lap = 4.801 km x 53 laps) in Tochigi Pref. on November 3. In the GT500 class race, the pole starting No. 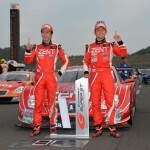 6 ENEOS SUSTINA SC430 (Kazuya Oshima/Yuji Kunimoto) led the entire race to the win. The Drivers Championship title went to the 3rd-place finishing No. 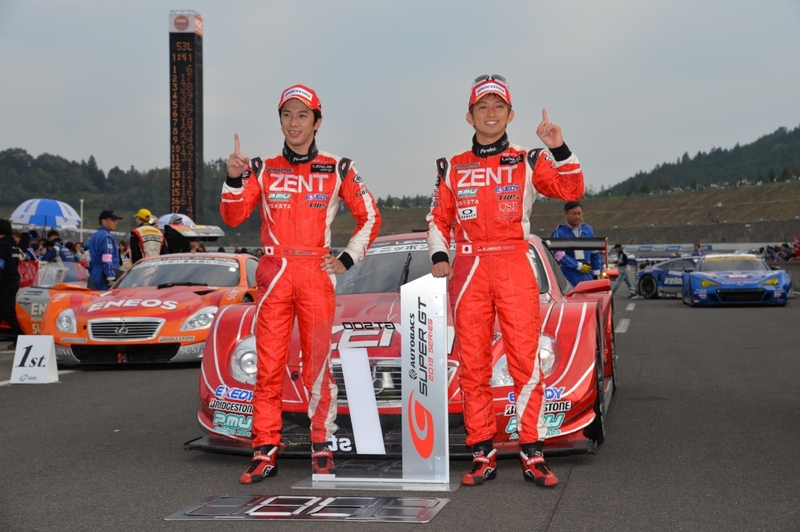 38 ZENT CERUMO SC430 drivers Yuji Tachikawa and Kohei Hirate. 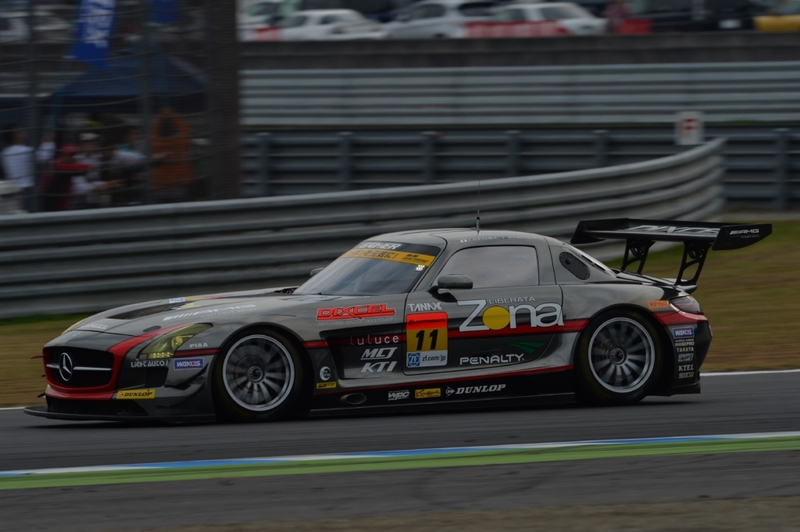 In the GT300 class, the No.11 GAINER DIXCEL SLS (Katsuyuki Hiranaka/Bjorn Wirdheim) was the winner. 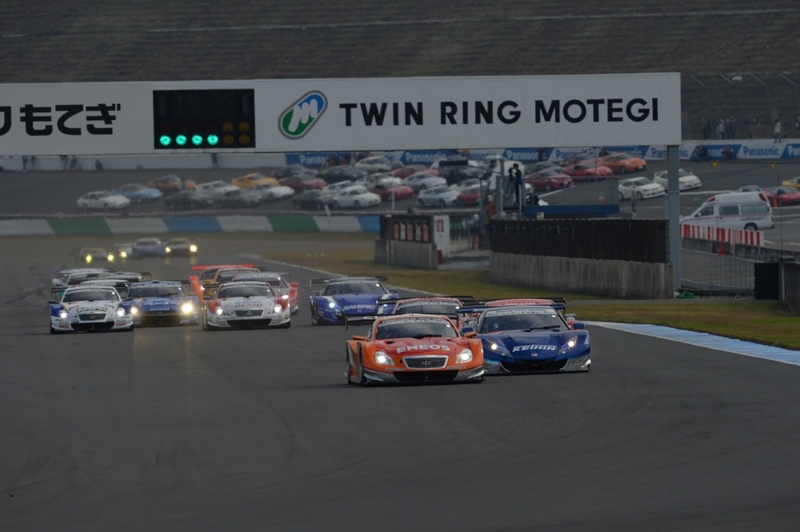 The GT300 class Drivers Championship title went to the No. 16 MUGEN CR-Z GT drivers Hideki Mutoh and Yuhki Nakayama. 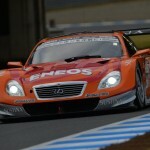 This was the first SUPER GT series title for a hybrid machine. 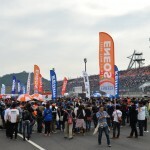 Under thin cloud cover the temperature was rising at 1:30 in the afternoon when the time came for the start of the last round of the 2013 season, the MOTEGI GT 250km RACE. As the results of this 53-lap race would decide the season championships, it was truly a final competition. After one formation lap the racing began at 1:34. All of the GT500 class cars accelerated toward the first turn, and while the front row starting No. 6 ENEOS SUSTINA SC430 (Kazuya Oshima) and No. 17 KEIHIN HSV-010 (Toshihiro Kaneishi) came out of the second turn in their starting order, behind them the No. 38 ZENT CERUMO SC430 (Kohei Hirate) came off a good start to pass the No. 23 MOTUL AUTECH GT-R (Ronnie Quintarelli). At the end of the first lap the No. 6 ENEOS SUSTINA SC430 was in the lead. Oshima had already built up a lead of 1.1 seconds over Kaneishi in 2nd position in the No. 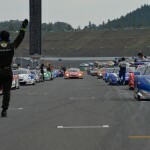 17 KEIHIN HSV-010, but close behind Kaneishi came the No. 38 ZENT CERUMO SC430, and behind them the No. 39 DENSO KOBELCO SC430 (Juichi Wakisaka) was preparing to make a move on the No. 23 MOTUL AUTECH GT-R as the competition heated up. As the No. 6 ENEOS SUSTINA SC430 began to pull away free of the pack, the No. 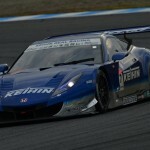 17 KEIHIN HSV-010 in 2nd position was being threatened by the No. 38 ZENT CERUMO SC430 in what had turned into a tough contest. On the fourth lap, Kaneishi in car No. 17 had the misfortune of running onto the gravel on the infield, which caused him to swing wide entering the S curve. The No. 38 ZENT CERUMO SC430 quickly took advantage of this gap to slip past into 2nd position. Now in 3rd position, the No. 17 KEIHIN HSV-010 next came under pressure from the No. 23 MOTUL AUTECH GT-R, while behind them the No. 39 DENSO KOBELCO SC430, No. 100 RAYBRIG HSV-010 (Takuya Izawa) and No. 12 CALSONIC IMPUL GT-R (Tsugio Matsuda) were involved in a three-way battle. As the No. 39 DENSO KOBELCO SC430 was challenging the No. 100 RAYBRIG HSV-010 coming out of the fifth turn of lap seven, the No. 12 CALSONIC IMPUL GT-R managed to take the inside and roar past both machines at once to move into 5th position. On this same lap seven, the No. 36 PETRONAS TOM'S SC430 (James Rossiter) that had started the race from 13th position would succeed in recovering to 7th position and begin to join the contest with the other title contenders. By the end of the 10th lap, the No. 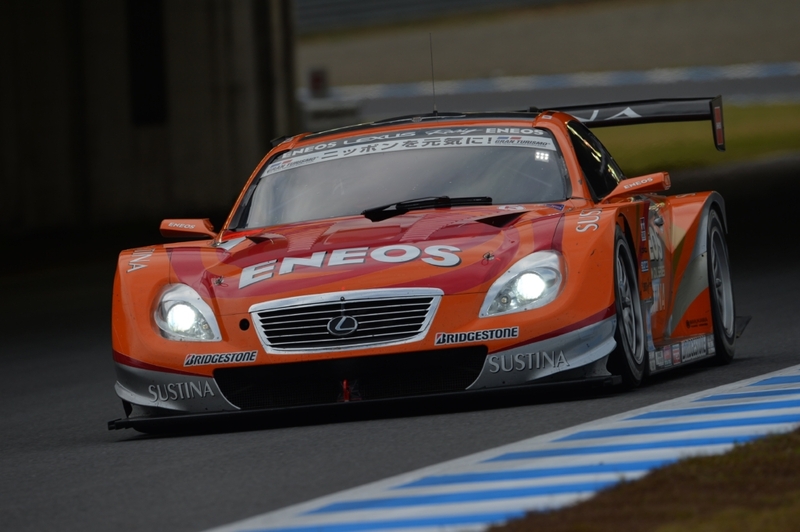 6 ENEOS SUSTINA SC430 had already built up a lead margin of about four seconds, and as the leaders began to come up on GT300 class back marker, No. 6's margin would only increase. By the end of lap 17, that gap with the No. 38 ZENT CERUMO SC430 in 2nd position had increased to more than 13 seconds. In contrast to the strong pace of the No. 6 ENEOS SUSTINA SC430, the pace of the other cars began to slow, causing the No. 17 KEIHIN HSV-010, No. 12 CALSONIC IMPUL GT-R, No. 39 DENSO KOBELCO SC430 and the No. 18 Weider Modulo HSV-010 to make their routine pit stop as early as the 19th lap. On the next lap the No. 38 ZENT CERUMO SC430 and No. 100 RAYBRIG HSV-010 followed suit. When the No. 38 ZENT CERUMO SC430 returned to the track after finishing its pit stop, the No. 17 KEIHIN HSV-010, having completed its pit stop the lap before, closed in on its tail, and while it looked at first as if there might be a change in the order for what would effectively be 2nd position, Yuji Tachikawa (No. 38) managed to hold off the fierce attack by Koudai Tsukakoshi (No. 17) and keep his hold on 2nd. On lap 21, when the No. 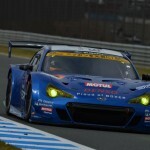 23 MOTUL AUTECH GT-R, No. 36 PETRONAS TOM'S SC430 and others finished their pit stops, only the No. 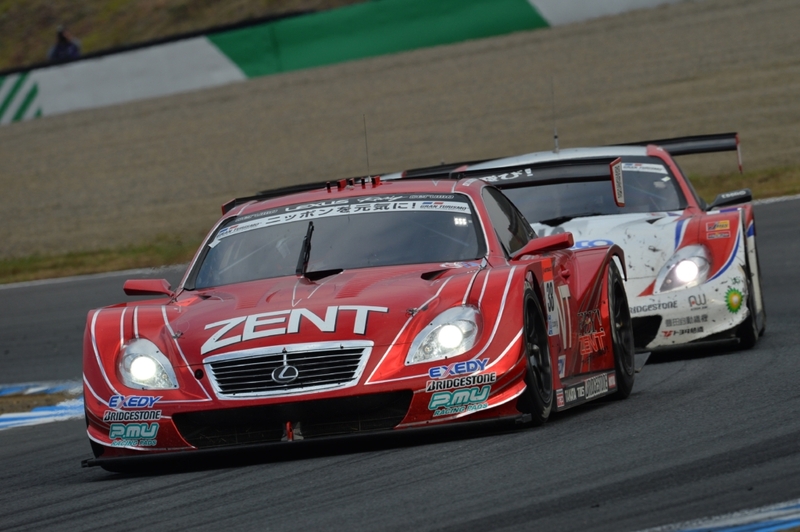 6 ENEOS SUSTINA SC430 continued to stay out on track, and Oshima kept running in the lead until lap 24. When Oshima turned over the wheel of No. 6 to teammate Yuji Kunimoto, his lead was nearly 20 second and Kunimoto was able to return to the race with the lead intact. By the time all of the GT500 class cars had finished their routine pit stop the top three leaders were No. 6 ENEOS SUSTINA SC430, No. 38 ZENT CERUMO SC430 and the No. 17 KEIHIN HSV-010. Following in 4th position was the No. 12 CALSONIC IMPUL GT-R (Joao Paulo de Oliveira), but on the 90° corner of lap 25, there was a collision as Oliveira battled with No. 39 DENSO KOBELCO SC430 that sent him off the track. Before he could recover, Oliveira was also passed by the No. 36 PETRONAS TOM'S SC430, dropping him to 6th position. About 20 seconds behind the No. 6 ENEOS SUSTINA SC430 running away in the lead, the No. 38 ZENT CERUMO SC430 and No. 17 KEIHIN HSV-010 were battling at close quarters, and the No. 39 DENSO KOBELCO SC430 (Hiroaki Ishiura) and No. 36 PETRONAS TOM'S SC430 (Kazuki Nakajima) were closing in as well. Making skillful use of back markers on lap 32, Ishiura managed to pass Tsukakoshi on the fifth turn and move into 3rd position. Having dropped to 4th position in this way, the chances of a come-from-behind title win for the No. 17 KEIHIN HSV-010 seemed to be slipping away, but on the 130R of lap 35 the No. 17 KEIHIN HSV-010 was able to re-pass the No. 39 DENSO KOBELCO SC430 and recover 3rd place. Charging on from there, No. 17 began to close again on the No. 38 ZENT CERUMO SC430. Struggling now to hold pace, Tachikawa had to work hard to hold off the attack, but on the first and second turns of lap 38, the No. 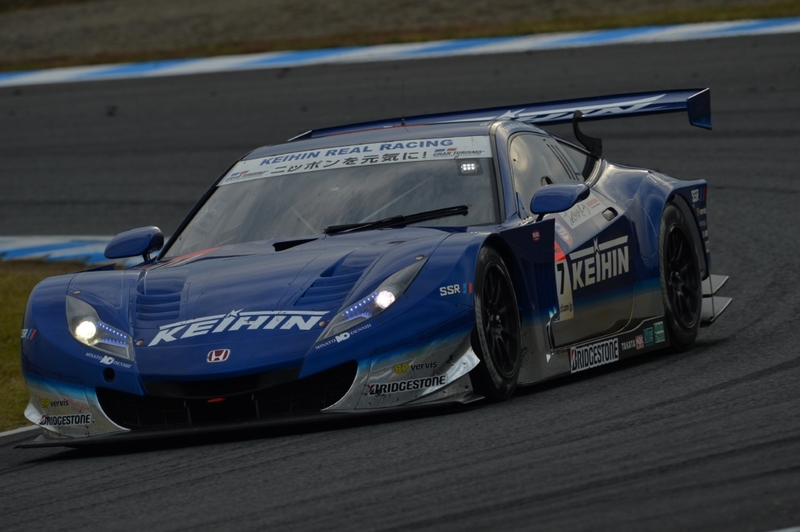 17 KEIHIN HSV-010 managed to squeeze in on the inside and pass Tachikawa into 2nd position. In order to win the season title, the No. 17 KEIHIN HSV-010 had to score seven more points in this race than the No. 38 ZENT CERUMO SC430, but the leading No. 6 ENEOS SUSTINA SC430 was still running strong some 27 seconds ahead. Meanwhile, the No. 39 DENSO KOBELCO SC430 and No. 36 PETRONAS TOM'S SC430 were closing in on the No. 38 ZENT CERUMO SC430 now running in 3rd position. 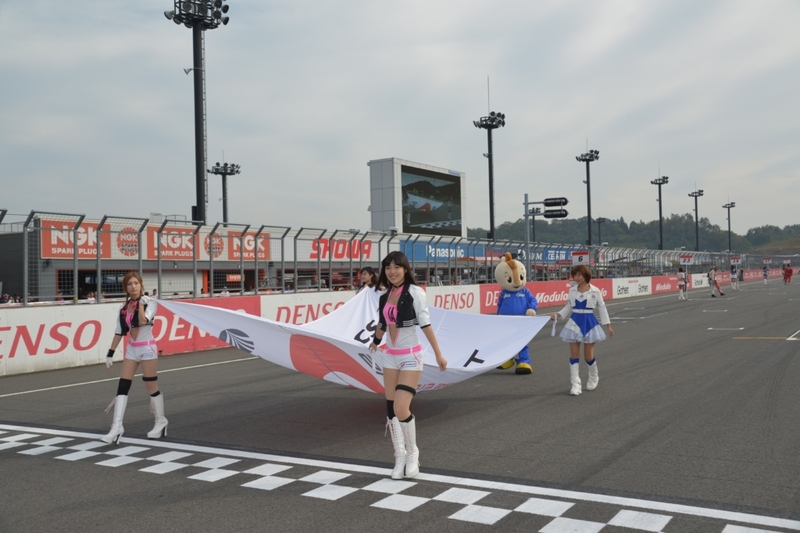 However, they would be no change in the order before the checkered ended the race with Tachikawa still holding on to 3rd. 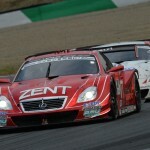 Having run unchallenged form the start, drivers Oshima and Kunimoto of the No. 6 ENEOS SUSTINA SC430 celebrated their first win as a pair. 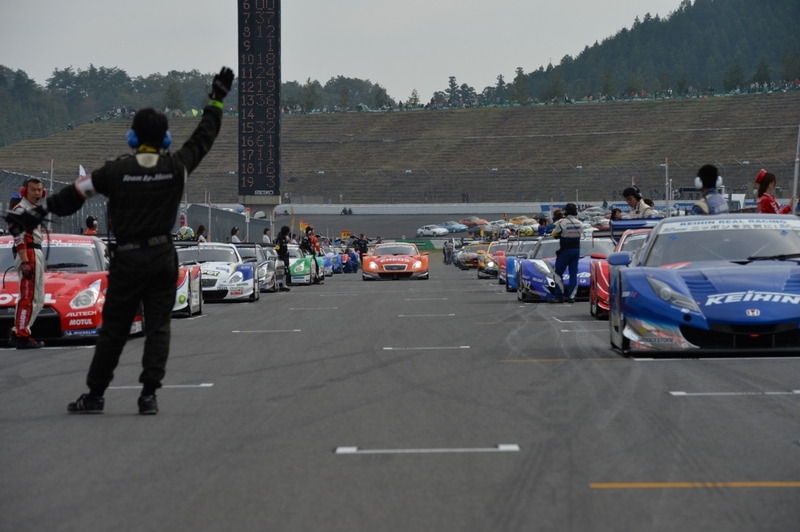 For Oshima it was his third GT500 class victory. The No. 17 KEIHIN HSV-010 finished the race in 2nd place and by finishing 3rd the No. 38 ZENT CERUMO SC430 team won the Drivers Championship title. This was the third title for Tachikawa and the first for his teammate Hirate. The Team Championship also went to LEXUS TEAM ZENT CERUMO, the team's first title. Lexus teams would fill out the other top positions with the No. 39 DENSO KOBELCO SC430 in 4th, the No. 36 PETRONAS TOM'S SC430 in 5th and No. 37 KeePer TOM'S SC430 in 6th place, making this race a contest of the Lexus camp against the No. 17 KEIHIN HSV-010. 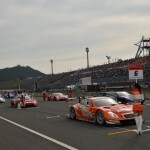 At the start of the GT300 race the pole-sitting No. 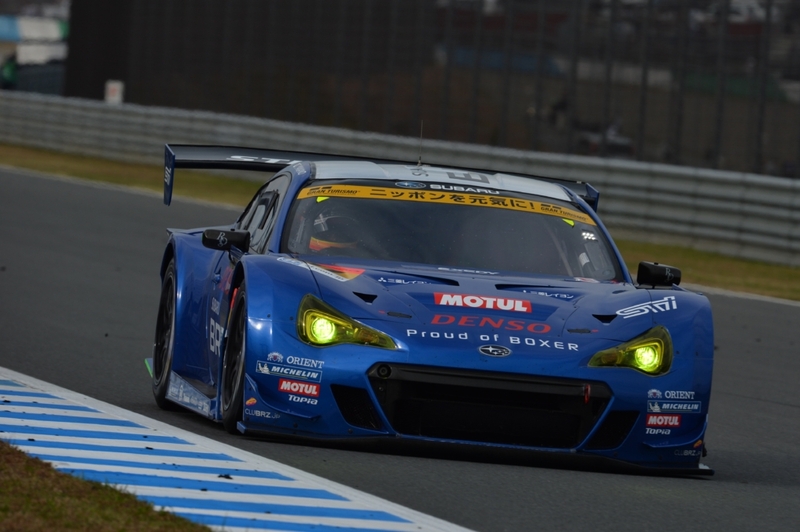 61 SUBARU BRZ R&D SPORT (Tetsuya Yamano) succeeded in holding the lead. Behind it followed two title contestants, the No. 11 GAINER DIXCEL SLS (Bjorn Wirdheim) and the No. 16 MUGEN CR-Z GT (Hideki Mutoh). Of these, the GAINER DIXCEL SLS was running at a pace about one second per lap faster that the others, and it only took until lap four before it had passed the SUBARU BRZ R&D SPORT to lead the race. After this, the GAINER DIXCEL SLS continued to run away at a fast pace, building up a lead of 10 seconds over the MUGEN CR-Z GT in 2nd position by the end of the 11th lap. Slightly behind the two lead cars came the SUBARU BRZ R&D SPORT and the No. 88 ManePa LAMBORGHINI GT3 (Takayuki Aoki). Entering the middle stages of the race, the first car to make its pit stop once the minimum required laps for a driver change was passed was the season's 4th-ranked No. 52 OKINAWA-IMP SLS (Hironori Takeuchi), which was attempting a come-from-behind title win. No. 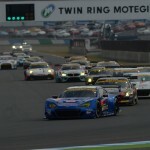 52 had already risen from a 20th-position start to move into 15th place when it made the earliest pit stop of any GT300 team at the end of lap 19. On the next lap the No. 4 GSR HATSUNEMIKU BMW (Tatsuya Kataoka) running in 7th position made its pit stop. With fresh sets of tires and relatively open stretches of track after their early pit stops, the OKINAWA-IMP SLS (Takeshi Tsuchiya) and the GSR HATSUNEMIKU BMW (Nobuteru Taniguchi) began to charge toward the front. The lead GAINER DIXCEL SLS made its pit stop at the end of lap 24. At this point, with the MUGEN CR-Z GT and SUBARU BRZ R&D SPORT (Kota Sasaki) had already making their pit stops and the ManePa LAMBORGHINI GT3 now running in 2nd position, the GAINER DIXCEL SLS now commanded a giant lead of 50 seconds over 2nd. When all the cars had finished their pit stops by the 33rd lap, the No. 11 GAINER DIXCEL SLS (Katsuyuki Hiranaka) led by a margin that had grown to 40 seconds over the MUGEN CR-Z GT (Yuhki Nakayama) in 2nd. 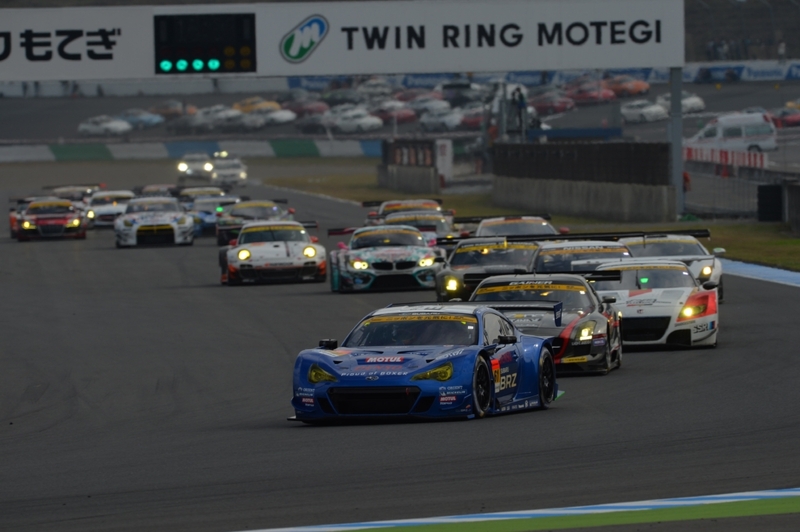 More than ten seconds behind 2nd came the SUBARU BRZ R&D SPORT (Kota Sasaki). With the success of its early pit stop, the GSR HATSUNEMIKU BMW was now in 4th position, just five seconds behind the BRZ. 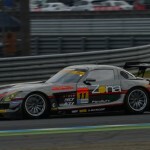 The OKINAWA-IMP SLS was now in 7th position. In this way, the race had become somewhat deadlocked in the second half. If the MUGEN CR-Z GT could finish the race this way in 2nd place, it could clinch the championship title regardless of the GAINER DIXCEL SLS win or any other cars' order of finish. So, for the MUGEN team there was now no need to push excessively, it simply had to continue running at a steady pace. On the other hand, Sasaki in the SUBARU BRZ R&D SPORT was chasing MUGEN CR-Z GT as hard as he could in order to move the race and make his teammate Yamano's brave racing in the first half not in vain. With two laps remaining in the race, Sasaki had reached the point where he could see the tail of the MUGEN CR-Z GT, but just then he suffered a costly spin. Although he was able to recover quickly, Sasaki now had the GSR HATSUNEMIKU BMW on his tail. Meanwhile, having been able to slow its pace thanks to its comfortable lead, the GAINER DIXCEL SLS cruised on alone to victory. It was the team's second win of the season following a victory in the opening round. The season championship now depended on the finishing place of the MUGEN CR-Z GT. 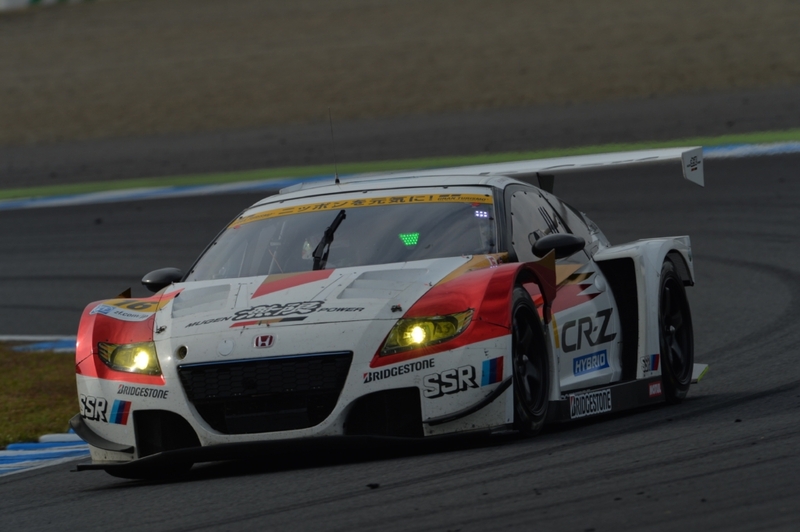 But, the MUGEN CR-Z GT remained in control and crossed the goal line in 2nd place to win the 2013 series GT300 class Drivers Championship title. Despite its earlier spin, the SUBARU BRZ R&D SPORT managed to secure a podium finish in 3rd. 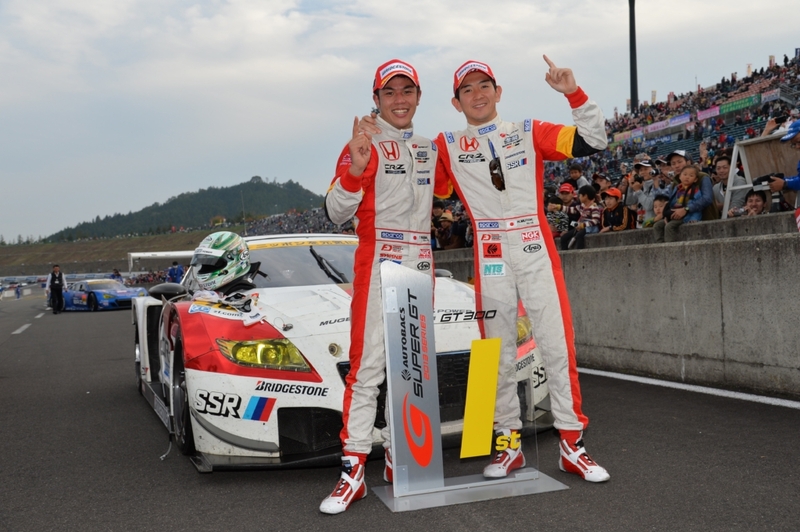 The final drivers ranking had the MUGEN CR-Z GT pair of Mutoh and Nakayama in 1st place, which was the first SUPER GT title for both of them. Although the MUGEN CR-Z GT had failed too win any of the regular series races this season, it scored four 2nd-place finishes and won points in every round. 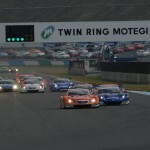 While it was not one of the championship series races, the MUGEN team also proved their champion credentials by winning round two of the Asian Le Mans series at Fuji Speedway. 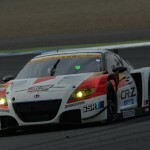 Also, the CR-Z became the first hybrid car to win a SUPER GT title. 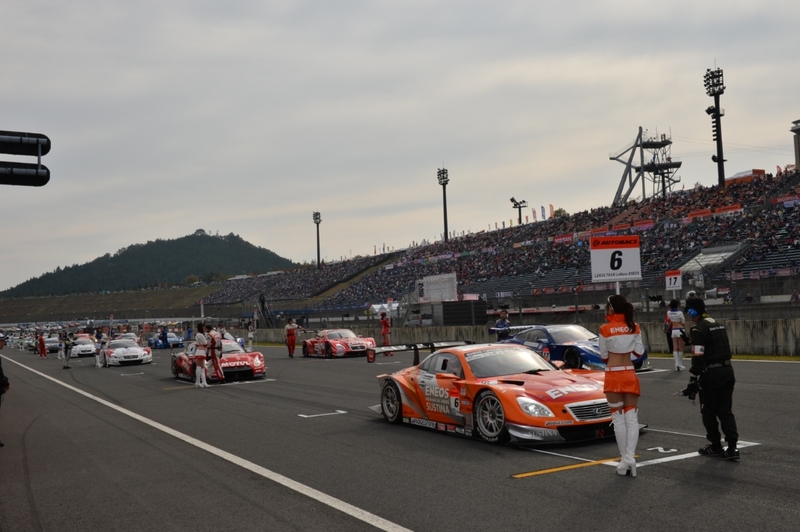 Finishing the season ranked second with two victories was the GAINER DIXCEL SLS pair of Hiranaka and Wirdheim. 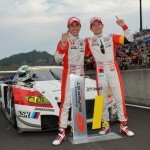 Third place in the ranking went to the consistently strong competitors Taniguchi and Kataoka of the GSR HATSUNEMIKU BMW team who scored consecutive wins in the closing rounds of the season.